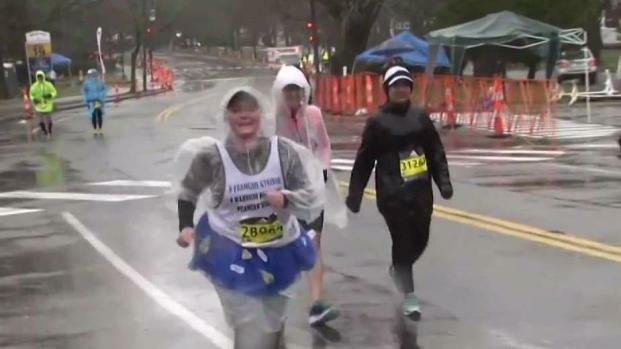 Cancer survivor Mary Shertenlieb wasn't about to let rain, wind or cold stop her. 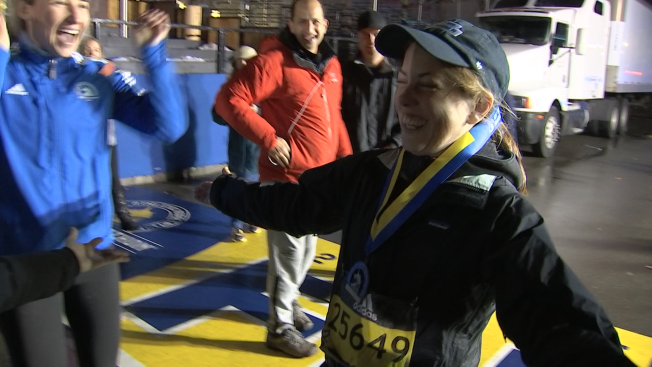 Shertenlieb crossed the Boston Marathon finish line at 12:18 a.m. Tuesday, about 13 hours after she started the race. The leukemia survivor was at mile 15 on Monday when she went to a medical tent, shivering, with purple lips, thinking she had hypothermia. She called her husband, Rich, and he suggested she come home, take a hot shower, put on dry clothes, then restart the run. The couple later went back to the spot she stopped and finished together, holding hands. She raised about $33,000 for cancer research. Rich Shertenlieb is co-host of the Toucher and Rich Show on Boston sports talk radio station WBZ-FM, known as 98.5 The Sports Hub. The cold temperatures, unrelenting rain and gusting winds challenged the marathon runners on Monday.